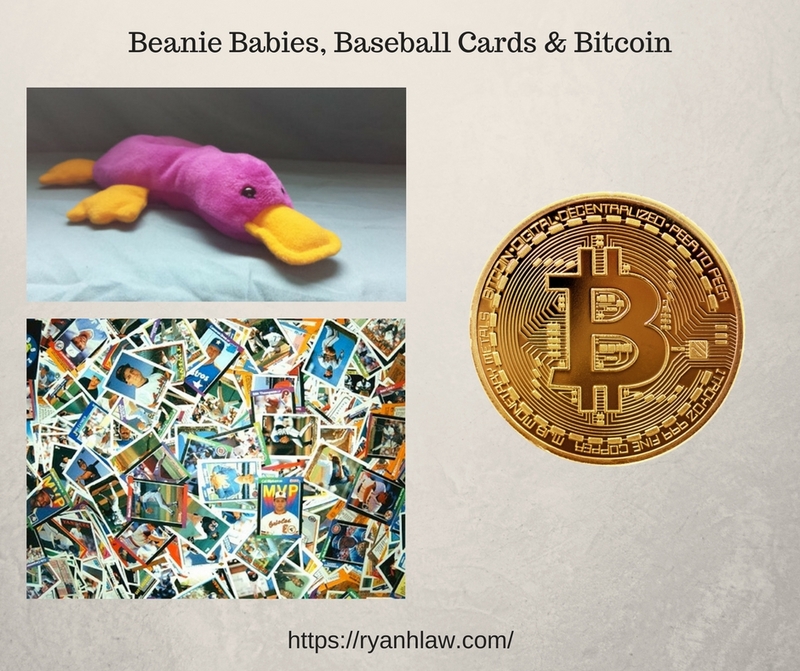 What do Beanie Babies, Baseball Cards and Bitcoin have in common? None of them are a good investment. 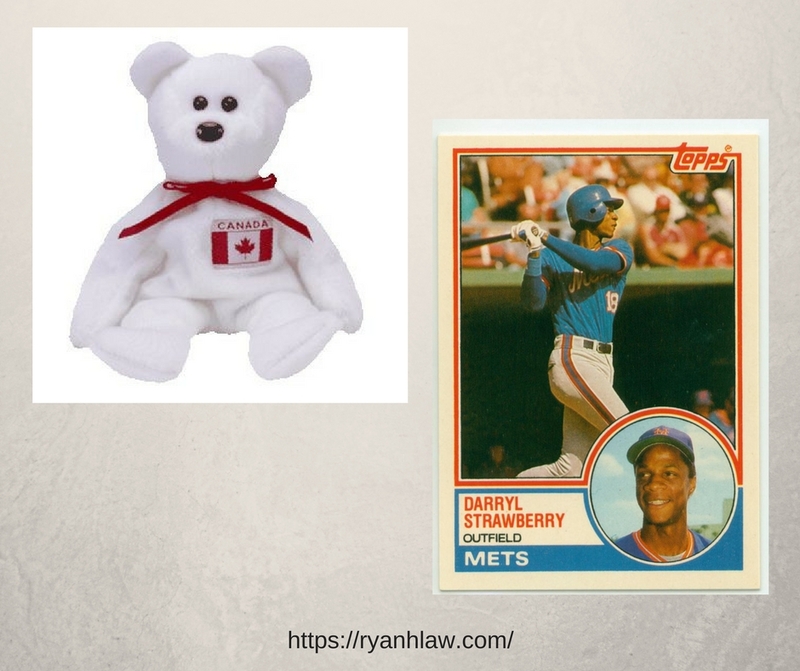 Both Beanie Babies and baseball cards produced no real value – they were hyped up by the market and the prices were artificially inflated. Again – these items held no intrinsic value – they did not produce any further value. 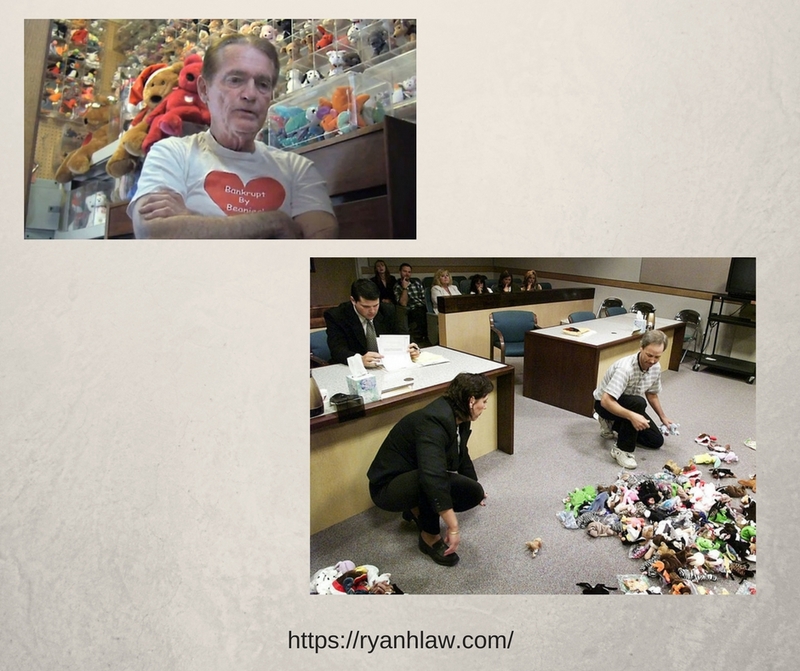 If you like Beanie Babies or baseball cards because you enjoy them, great, but if you bought them as an investment it was a bad gamble. 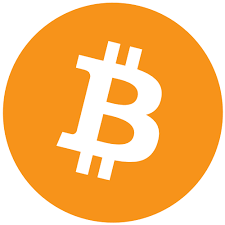 Without getting technical, Bitcoin is a form of currency (called cryptocurrency). It is “mined” by massive computers running complex algorithms. According to a Bitcoin forum5 someone trying to mine bitcoins on a home computer will mine about 0.00001406 bitcoins per week, which means it will take well over 1,000 years to mine 1 Bitcoin. Clearly mining isn’t the way to make money. The basic idea behind cryptocurrencies like Bitcoin is that there is no bank or government or currency backing it up. If you own a Bitcoin you own an electronic coin that you can (hypothetically) use to purchase items (although the documentary Life on Bitcoin6 shows how hard that can be). The basic idea would be that if a Bitcoin was worth $1, you could buy a $1 drink for 1 Bitcoin. You transfer ownership of that Bitcoin to the company selling you the drink. If a Bitcoin is worth $2 you would transfer ½ a Bitcoin to buy that drink. The new owner can either spend it or save it. People buy Bitcoins in hopes that they will go up. For early adopters, it went well. In 2010 the highest price was 39 cents. Bitcoin hit its high price on December 17, 2017 at $19,843.11.7 If you bought 100 Bitcoins at 39 cents each and sold them on December 17, 2017 you would have made $1,984,272 ($1,984,311 minus $39 initial investment). Not bad, right? Wait – you didn’t buy any when it was 39 cents?!? Too bad. I didn’t either. Let’s say you wanted to buy Bitcoin starting in 2018. On January 1 it closed at $13,500. It reached a high on January 6 at $17,152. On January 22 it closed at $10,823. Will it go back above $13,500? It’s hard to say. It might, but it might drop back down to $100. By the way, let’s say you owned one Bitcoin when it was worth $10,289.26. To buy that same $1 drink with Bitcoin you would transfer 0.000097 Bitcoins. There’s some fun math for you! However, people aren’t buying Bitcoin to buy a $1 drink (there are few places in the world where one can do that). They are buying Bitcoins in hopes that someone else will buy them for more. It is a purely speculative investment, with far more risk than most people should take on. Maybe you can buy one Bitcoin today at $10,832 and it will be worth $100,000 next year. Maybe it will be worth 39 cents. That’s what speculative investments do. Yes, there are cryptocurrency millionaires. There are also others who have lost far more than they could afford to. When people realize that there is no intrinsic value in Bitcoins they will have nothing. Hopefully they can find comfort in their Maple Bear Beanie Baby while holding their Daryl Strawberry rookie card. I recommend that you stick to real investments where real value is being created. Slow and steady wins the race. If you really, really want to buy Bitcoin never invest more than you can afford to lose, and speculative investments should never make up more than about 5% of your total portfolio. By now you’ve probably heard about Wells Fargo and the $190 million fine they are being issued because their employees created more than 2 million unwanted deposit accounts and credit cards for their customers. Because of the scandal 5,300 employees have lost their jobs. Wells Fargo customers have paid hundreds of thousands of dollars in fees for these unwanted accounts. Why did the employees create fake accounts? The employees are paid an incentive for every new account or credit card they opened. They might get $3 for signing someone up for online banking, or $5 to open a savings account, or $20 if they open a new credit card. Imagine the incentive there – if an employee making minimum wage could open 2-3 new cards a day, that makes a big difference in how much they take home. How did so many accounts get opened without customer’s knowing about it? Some customers did notice, and they would get the accounts closed. Others probably noticed, but didn’t take the time to get them closed. Others probably didn’t notice it. Far too many people don’t really pay attention to their accounts or even their balances. 5,300 employees are a tiny portion of Wells Fargo’s workforce. They have 265,000 employees, so 5,300 is only 2% of their work force. 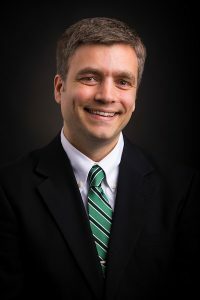 Also, the firings took place over several years, not just today as most news stories are indicating. The majority of Wells Fargo employees are honest and wouldn’t do something like this. Will they encourage you to open a credit card? Sure. They might take home $20 if they can convince you, but most of them would never dream of opening one up for you after you said you weren’t interested. 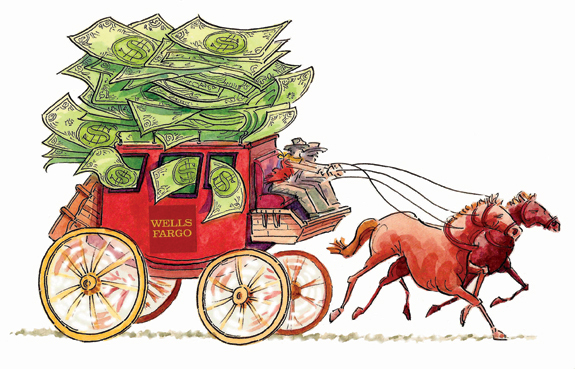 $190 million means nothing to Wells Fargo. They are worth $250 billion, so $190 million is only .076% of the bank’s net worth. If you have a net worth of $200,000 a fine of .076% would be $152. Annoying? Sure. But it isn’t going to cause any trouble to your budget or your net worth. Some people have asked if the fine is high enough. It probably isn’t. Wells Fargo has agreed to change their sales practices and provide more oversight, and anyone who paid fines or fees will receive a full refund. Many banks offer their employees these types of incentives. The more accounts a person has with a bank the more tied in they are, and the harder it is to leave. Employees are incentivized for helping tie you in with that bank for life. Watch your accounts. Be sure to check your accounts regularly to make sure nothing is being charged or added to your accounts. Keep things simple. You don’t need 12 accounts at 9 different banks in the area. You should have one main bank. If you have little accounts open at other banks because you got a free toaster for opening an account, get them closed. Switch to a local credit union. Credit unions are owned by their members, and they charge fewer and lower fees and will give you better rates on loans. You can also get to know the managers. Most of them are happy to meet with their members and will help you out if there is a problem. There is no reason for you to pay any maintenance fees on your checking or savings accounts. There are plenty of credit unions and banks that have free checking and savings accounts with no minimum balance requirements and no limit on the number of transactions you can make per month. I encourage you to be proactive about your banking by taking these simple steps to protect yourself. And if you have a Wells Fargo account, pull up your online banking and make sure no accounts were opened for you that you didn’t want or ask for. Check for fines and fees you shouldn’t have paid. They will be contacting their customers to let them know how to get a refund.